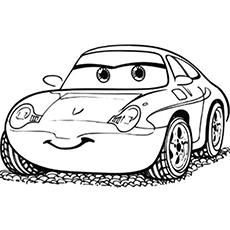 Cars and Cars 2, Disney’s animated movies on anthropomorphised vehicles has become a hit among kids of all ages. With so many colorful characters- literally and figuratively- this series is also perfect for compiling a coloring book. 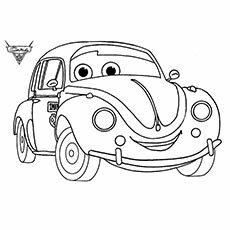 Here’s where you can make a collection of coloring pages of cars 2 movie, the following are the top 25 car coloring pages printable. 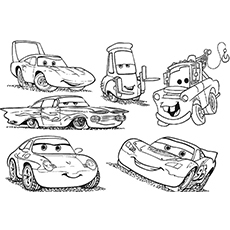 This coloring picture shows Lightning McQueen and his friends, looking happy and cheerful. 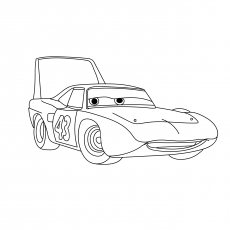 The picture is not one story but contains isolated images of McQueen, Sally Carrera- McQueen’s love interest, Ramone- who paints McQueen in edgy decals, Guido- who performs the fastest pit stop at the race and Mater- McQueen’s best friend. This car, whose design was inspired by several cars, is a British secret agent. 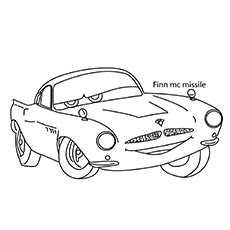 Out of some misunderstanding and mis-communication, Finn mistook Mater to be a highly intelligent American spy in disguise. Finn McMissile has a dark pistachio green color and this portrait of the secret agent, smiling into the camera looks suave indeed. Francesco Bernoulli is the international Formula Racer champion. 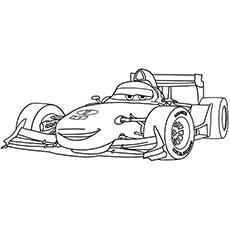 This open wheel car is looking his usual smug self in the picture. He painted himself in the colors of his country’s flag, the Italian tricolor and the same can be done to this coloring picture. 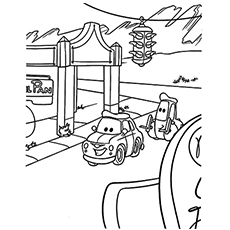 There is a lot of detailing in this picture that kids are sure to love coloring. In this scene, Mater seen engaged in one of his shenanigans. Mater is sneaking up on the tractor. 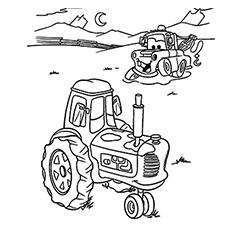 As seen in the movie, he would loudly honk and hoot as he approaches the tractor, which is surprised and scared and falls over. The picture is of the night time field, and the moon is up on the clear night sky. This is the car version of Queen Elizabeth II, which is a classic Rolls Royce Phantom model. She was at the final lap of the race and even knighted Mater at the end of the movie. The roof rack of the car is a decadent crown, befitting the queen. The car is embellished in royal ornaments. Luigi is a 1959 Fiat 500. This eccentric Italian car is a great fan of Scuderia Ferrari and does not recognize McQueen to be quite in the league of the great Ferrari. His peppy yellow color would be a treat to fill in this coloring picture. Luigi is pictured wearing earphones in this image- which was his race track avatar. Miles Axlerod is the oil baron who starts Allinol- an alternative fuel. This legendary car circumnavigated the world without any GPS. Ultimately Axlerod wanted to use Allinol as a mode of taking over the world as cars using his alternative fuel was blown up by an electromagnetic pulse. 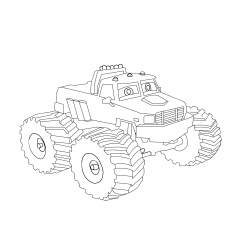 It was Mater who worked out his plan and called on it. 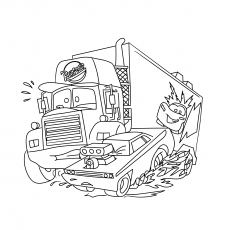 Luigi and Guido, Luigi’s friend and an Italian forklift truck, are seen cruising down the roads of Radiator Spring. The different stores and their neon signs are seen in the background as the two friends happily rolling down the deserted road. Professor Zundapp or Professor Z is the main mastermind behind the Allinol and electromagnetic pulse invention. 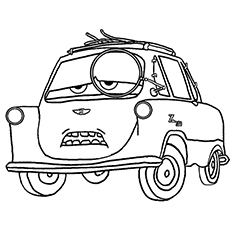 This lemon car is seen wearing a monocle with his usual bored expression in this picture. Holley Shiftwell is an attractive British secret agent in training. She is also Mater’s love interest in the Cars 2 film. She has a bright purplish pink colour which girls would love to fill in. Cars are machines after all! They need some care and repair. This shining car is smiling in the garage. It is ready for the road, after being taken care of by the expert mechanics. 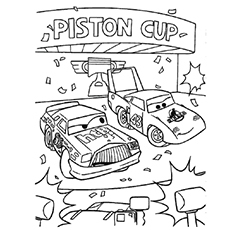 Piston Cup is the famous race that happens in the film ‘Cars’. The cars that take part in the race are Lightning McQueen, Strip Weather, Chick Hicks, Dale “Juniour” Earnhardt Jr., Aiken Axler, Claude Scruggs, Todd Marcus, Billy Oilchanger, Winford Bradford Rutherford to name a few. It is great to watch Formula One races on television and play car racing video games. So he will be excited to color this page. Little boys love playing with miniature cars, and this page will be his favorite! The Rust-eze Brothers, Rusty and Dusty are the spokes cars and owners of Rust-eze. 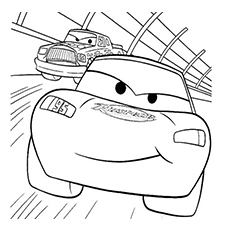 Rust-eze is the team that sponsors Lighting McQueen; this team gave the Rust-eze brothers ‘big break’. Rusty is a 1963 Dodge Cart and Dusty is a 1964 Dodge A100. They appear thrice in the film. The Rust-eze brothers add to fun and make the film appealing to the kids. They will also enjoy coloring this page. Let your child use his favorite colors to make this van look vivid. The Bugatti Veyron EB 16.4 is a mid-engined supercar, designed and developed by the Volkswagen Group and is manufactured by Bugatti Automobiles S.A.S. in Molsheim, France. The super sport version of Veyron is recognized by the Guinness Book of World Records as the fastest street-legal production car in the World, with a top speed of 431.7km/h. All credits to the chief designer Hartmut Warkuss and Jozef Kabaň, under the guidance of engineering Chief Wolfgang Schreiber. This sports car can be customized according to the buyer’s needs, this makes it so popular. Small boys love to collect interesting trivia about cars; you can surprise him with this information regarding Bugatti. He will be glad to know that his mummy takes interest in cars too! A police car is very easy to spot on the road, courtesy the red siren on the top of the car. The word Police is also written on the car with the logo of the government, since Police executes the State’s laws. Children look up to police for their powers to put criminals into the prison. They will color the car exactly like the one see on the road, this will give you an idea that their observation skills are gradually developing. 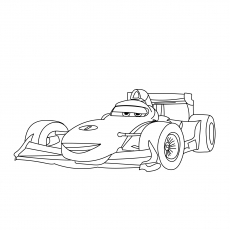 “The King” Strip Weathers has really struggled to be a part of the glitzy sponsorship and media attention; it has humble beginnings on the Piston Cup Circuit. The King Stripweather is a 1970 Plymouth Superbird with a 426ci hemi engine. The other names for the car are Old Daddy Rabbit, Old Man and Mr. The King. The Superbird was a heavily modified version of the Plymouth Road Runner, it is designed stock car racing. The King has bigger wheels but a shorter wheel base. Your child will love this smiling sports car with an unusual bonnet. It is usually light blue in color, but your child is free to color it according to his wish. Children love connecting dots and finding out the hidden picture. There is a sense of mystery that makes them curious to complete this picture. 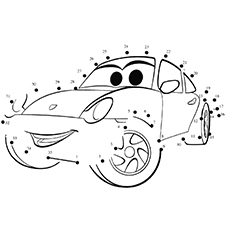 Make sure he connects the dots correctly; it will teach him the numbers in a fun way. As a parent, you can also gauge your child’s cognitive development. 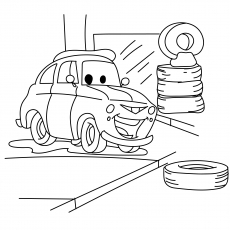 Notice, your child pay attention to the minute details while coloring the car. This picture is unimaginable! Have you ever see a car taking a helicopter ride? This picture will not only make your child giggle, he will be really amazed. 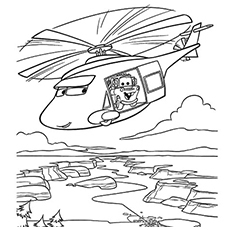 The car has a smiling face and is excited to take this helicopter ride and watch the scenery from the bird’s eye view. The helicopter is also very happy, probably thinking he is making this little car so happy! There is ample scope for experimenting with colors and using one’s imagination to the maximum extent. Ask your child to use water colors or felt pens, rather than just using pastel or wax crayons. This must be the uber-cool Lamborghini! It is a luxury car manufactured in Italy to compete with the popular Ferrari that once took the world by storm and still a very popular car. Sports aficionados and those who love stylish cars will love this super car. So what is different or special about this car? The door of the car opens in an upward direction and is operated automatically, by just pressing a switch on the dashboard! 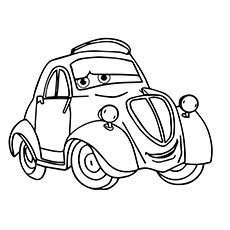 Your child will enjoy coloring this car, you can ask him to use glitters to give it a shiny body and that streamlined look. Your child creativity will make this car the most attractive car in the world! The car has big wheels and is often used for a military purpose. The tough and big tires make the car durable and it can travel on rough terrain. The bonnet of the car is open and one can pile their luggage on the back of the car. This semi-hooded car has a flag on its side. This car is a great option for jungle safaris and bird watching. Your little one, who plays with toy cars, would want to own a car like this one when he grows up. It is every child’s dream to have an awesome car, you must encourage this dream by inspiring him to work hard and study hard to buy this car. Who doesn’t want a car without hood and get a feel of the road during a long drive. Good cars make journeys a great experience. This car is of such kind. This type of cars with or without hoods is popularly called convertible and ranks high on style quotient. You can see such cars in films with a handsome hero riding it, trying to woo his lady love. In this picture, we see this convertible jeep has durable wheels and comfortable seats, and it will a great companion for a long journey. The simple structure makes the car easy to drive. So this elegant car will be another addition to your child’s wish list! The Ford Mustang is an automobile manufactured by the Ford Motor Company. Its design is based on the North American Ford Falcon, a compact car. Mustang has undergone various transformations to its current sixth generation. Mustang created a series of ‘Pony car class’ of American automobiles. This car gave rise to competitors like Chevrolet Camaro, Pontiac Firebird and AMC Javelin. Mustang is credited for inspiring designs like Toyota Celica and Ford Capri, which were imported to United States. This car designed by John Najjar Ferzely, Phillip T. Clark and Joe Oros. Your child will definitely use his favorite colors to make this Mustang look even more appealing and powerful. He will also enjoy coloring the word Mustang, and he will remember the name of the car better. Its macho look will be loved by little boys! The race is on and we see the cars vying with each other on the track. Each car wears a different expression, to show how they are feeling about the race! Are they thinking, is there any chance of winning? Children find car races exciting and adventurous, and they will enjoy coloring these expressive toy cars on the race track! 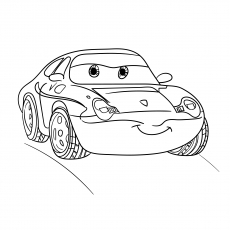 Sally Carrera from the Pixar animated film ‘Cars’ is the attorney of the town Radiator Springs. 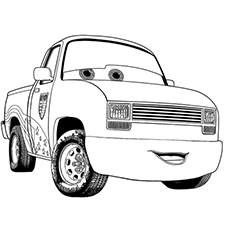 She is also the love interest of Lightning McQueen, her voice over is given by Bonnie Hunt. 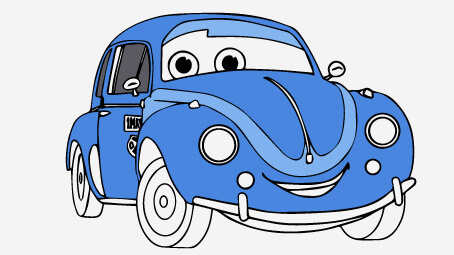 This cute blue car character also owns a motel named ‘Cozy Cone’ in the film, where individual motel room is designed as an oversized traffic cone. 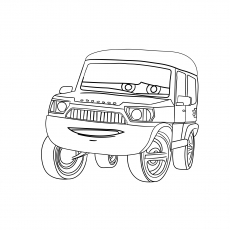 Your child will enjoy coloring this car named after the creator, you can always help him to know more about John Lasseter and the type of techniques he used to making these anthropomorphic car characters for the film Cars and Cars 2. This car as shown in the film as sunshine yellow, but your child can use his favorite shades to make this picture look brighter. 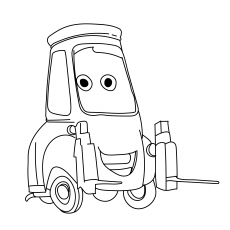 The Cars characters are funny, expressive and are super-efficient. There are many other car characters that you can colors other than these, but these car characters make the film really special. 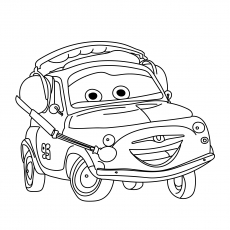 You can also create a collage by cutting out the car characters after your child has completed coloring it. Also you can make bright flash cards, and tell them interesting trivia about each car. This will make him curious to know more about the cars, inculcate the habit of researching on the internet about things they would like to know more about. So why wait, ask your kids to assemble all his coloring kits and have an enjoyable coloring session. Make the coloring session an enriching learning experience for your little one! 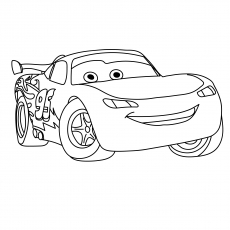 If you or your child has a thing for cars, then cars 2 coloring pages can be source of endless fun and excitement together. 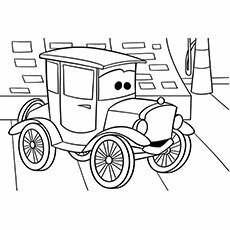 Print these free printable cars coloring pages and take out your colors and delve into a world of racing and vibrant colors.